Even amid recent trade tensions between China and the United States, it seems Chinese citizens are enamored with the idea of living in the United States—so much so that they wish to be reincarnated there. A widely circulated online post published on Aug. 6 claimed that an ancient Buddhist place of worship in Kunming City, Yunnan Province located in southwestern China, offers a special service for those who want to secure a good afterlife for their deceased loved ones: For an additional 500 yuan ($73), monks at the temple can perform rituals to guarantee that the deceased will be reincarnated in the United States. 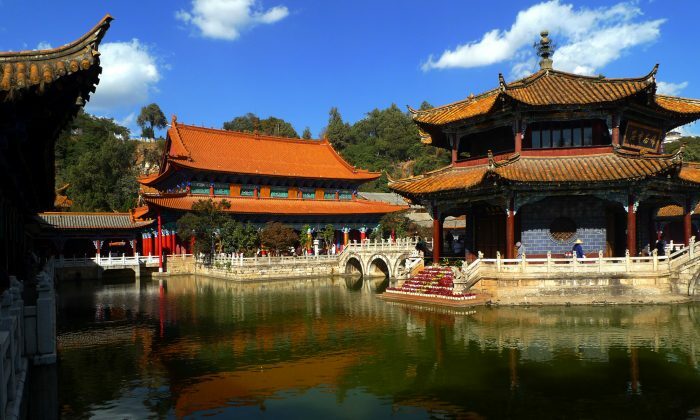 Yuantong Temple—one of the oldest Buddhist temples in Kunming—has a history of more than 1,200 years. Reincarnation is a key element of the Buddhist faith. Later, Yunnan.cn called the Yunnan Provincial Ethnic and Religious Affairs Committee—a Chinese Communist Party agency—to inquire. The person in charge said that rumors about such services surfaced 10 years ago and make the rounds on the internet every few years, and insisted the claim is false. The Buddhist association sanctioned by Kunming authorities later warned people not to fall for the scam, according to a report by state-run newspaper People’s Daily. The rumored afterlife deal reveals the extent to which Chinese aspire to the American dream. According to a Gallup poll released in 2012 that surveyed adults around the world who wish to move out of their native country permanently, 150 million indicated a wish to move to the United States. Potential migrants to the United States from China top the poll at 22 million. A more recent survey, conducted between March and June this year by the Hurun Research Institute in China, found that of more than 200 Chinese people defined as “high net-worth” and who have emigrated or plan to do so, the United States is the most desirable destination—followed by the United Kingdom, Ireland, and Canada. Many netizens expressed similar sentiments upon reading about the rumor. “Many people want to leave China. They cannot leave China in this life, so they wish they won’t reincarnate in China in the next life,” one commented. In recent years, many local governments have regarded temples and other religious places of worship as cash cows, aggressively developing them into tourist sites to make money. Temples have commercialized their operations as a result.